Translated literally, Coq au vin means Rooster with wine. As the name implies, the dish was originally made with Rooster rather than the nowadays easier to obtain chicken. Packed with flavour, it tastes absolutely spectacular and as recipes go is a true French classic that is relatively cheap to make. Prepare the marinade; put the chicken into a bowl, add the wine, Port, carrots, bay leaves, rosemary, onions, cloves and peppercorns. Cover and leave to marinate for at least three hours but preferably overnight. After the marinating time has passed, drain the chicken making sure to reserve the marinade, pat dry the chicken. Discard the carrots, bay leaves, rosemary and onions. Season the chicken with the salt and pepper. Sauté the diced bacon until golden in a frying pan before putting aside on a plate. Using the same pan, melt a third of the butter, add the shallots and sauté until slightly browned before setting aside. Again, using the same pan, melt another third of the butter; add the mushrooms and sauté for 5 minutes. Remove and set aside. Add the remaining butter and oil to the frying pan, add the chicken and sauté until golden and stir in the flour. Transfer the chicken to a casserole dish and add the stock. Pour the brandy into the frying pan and boil, stirring to deglaze the pan before pouring the brandy and juices over the chicken. Add the reserved marinade, shallots, mushrooms, bacon and tomato paste. Cook over moderate heat for 45 minutes, or until the chicken is cooked through. If after the 45 minutes the sauce needs thickening, lift out the chicken and bring the sauce to the boil. In a saucepan, mix together butter and flour to make a beurre manie and whisk into the sauce. Boil, stirring until the sauce thickens. Return the chicken to the sauce and add the parsley. 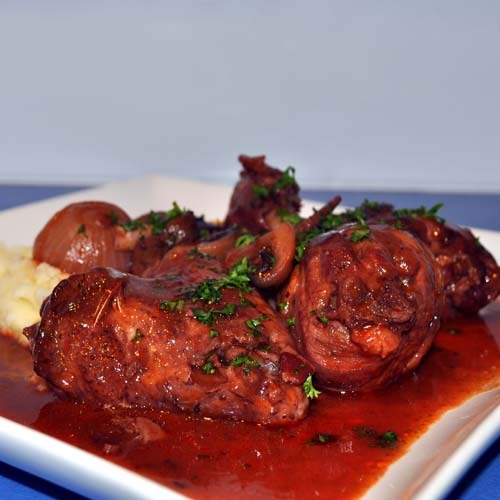 To serve, lay down a bed of mashed potato and arrange the Coq au Vin on top or beside it. In days gone by rather than using a beurre manie, the sauce was thickened using the blood of the rooster used in the dish. What a wonderful site you have here. I love your photos. If you wont mind, I'd love to guide our readers to your wonderful post. Just add our teeny widget http://www.foodista.com/recipe/RWWD6T3Y/coq-au-vin/widgets at the end of this post and its good to go. Thanks! Could I cook this recipe in the oven? Yes, once the chicken is placed into the casserole dish it could be cooked in a pre-heated oven at 150 degrees for 45 minutes to an hour rather than on the cook top. Before this stage though, the flavours depend on the cooking method outlined in the recipe so if you can I’d suggest sticking to the frying pan for the first steps.